During legislative session on Oct. 9, Jenna Harnish of Ulster was welcomed to the state Capitol in Harrisburg by Rep. Tina Pickett. Harnish was recently selected as the 2018-19 Pennsylvania State FFA president. 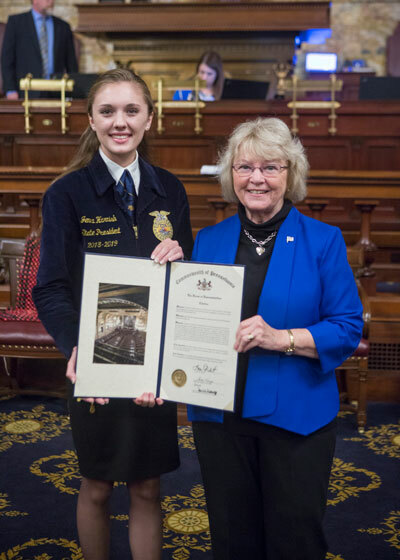 HARRISBURG – Rep. Tina Pickett (R-Bradford/Sullivan/Susquehanna) today welcomed Jenna Harnish of Ulster in the historic chamber of the Pennsylvania House of Representatives and congratulated the Athens Area High School graduate on being selected as the 2018-19 Pennsylvania State FFA president. As part of her duties, Harnish will host conferences and visit FFA chapters and chapter banquets throughout the state, in addition to promoting agriculture on a national level by attending the FFA National Convention and The Big E exposition. She earned the title after competing with 27 other contestants who completed a lengthy evaluation process, which include an application, FFA knowledge test, group challenges and rounds of both pre-written and extemporaneous speeches. Jenna Harnish of Ulster was welcomed to the state Capitol in Harrisburg by Rep. Tina Pickett on Oct. 9. 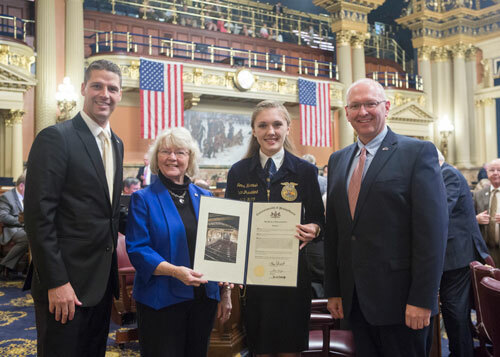 Harnish was recently selected as the 2018-19 Pennsylvania State FFA president. They are pictured with Rep. Clint Owlett (R-Bradford/Tioga/Potter) and Rep. Martin Causer (R-Potter/Cameron/McKean), who serves as chairman of the House Agriculture and Rural Affairs Committee. While at Athens Area High School, she participated in FFA all four years and specialized in public speaking. She was also the 2017-18 Bradford County Dairy Princess. Next fall, Harnish will continue her education at Penn State University.